3-D Monster: "Night of The Creeps" is on Crackle! 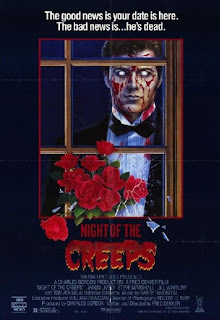 I don't now if this is old news or not, but I was looking around for something to watch on my computer, and I was delighted to see that the 1986 cult classic, "Night of The Creeps" is currently being shown on Crackle. If you have not seen this, then watch it NOW - I highly recommend it as essential viewing for both the horror AND sci-fi genres!